The Shark Evoline series is one of the most versatile and best-selling modular helmets. 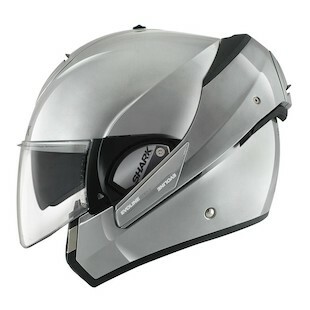 It's the only helmet with a flip-up chin-bar that goes all the way back to provide open face functionality. 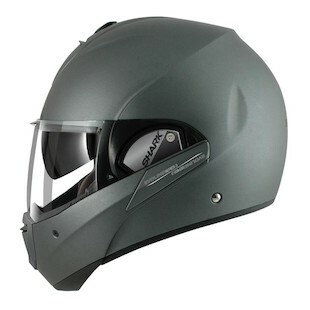 No other helmet gives you such options between street/road riding, open or full face. The Shark Evoline 3 ST helmet series 3 continues the evolution with faster opening auto-up chin-bar, reduced noise and improved aerodynamics in both full face and open face modes. Other improvements include: reduced weight, easyfit system for comfortable use with glasses, new quieter design and improved interior ventilation and new comfortable interior with high quality washable fabrics. As with other models, made with lexan polycarbonate shell, sharktooth ready, integrated drop down sun shield and ECE 2205 approved.